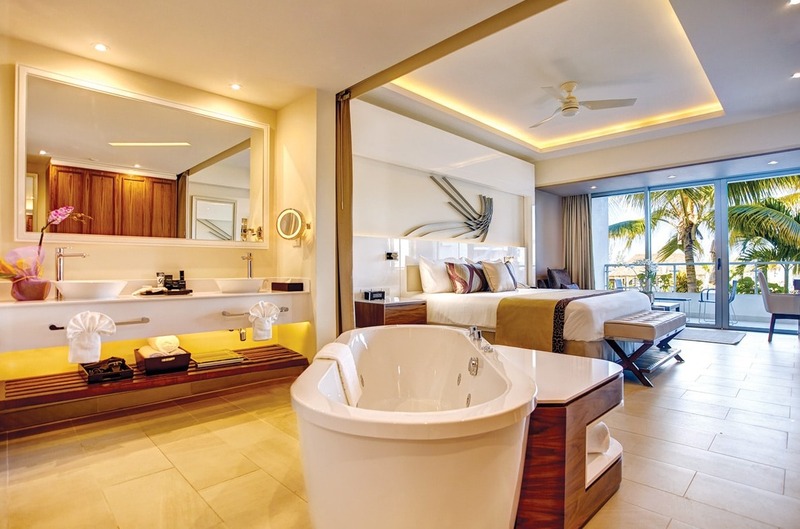 Rooms at Royalton Blue Waters feature in-suite Jacuzzi tubs. All-inclusive Royalton Blue Waters opened in Montego Bay, Jamaica on Nov. 1, 2016. The resort is adjacent to the existing Royalton White Sands, and features a supervised kids club, an on-site splash pad with slides, a full-service spa and three pools. The new resort has 228 guest rooms with signature Royalton touches such as DreamBeds, high thread count sheets, double-headed rain shower and Jacuzzi, plus a choice of balcony with ocean views or swim-out suites with patios leading to a semi-private pool. Guests who upgrade to Royalton Blue Waters’ Diamond Club gain access to an exclusive lounge featuring premium drinks, canapés and dedicated butler service, as well as an exclusive beach area and special pillow menu. Royalton’s unlimited reservation free dining features a buffet and a choice of 7 à la carte restaurants including a steakhouse, Asian restaurant with sushi bar, and jerk hut. There are a variety of bars and lounges throughout the resort, including a sports bar, martini bar and swim-up bar. Activities at Royalton Blue Waters include snorkeling, kayaking, cooking classes, beach volleyball, dance lessons, trivia and more. An introductory scuba lesson in the pool is included. Royalton Blue Waters is located 35 minutes from Sangster International Airport (MBJ) in Montego Bay, Jamaica. For more information, visit Royalton Blue Water’s website.